In our quest to make the ultimate cruelty-free boots we have produced the 10 Eye Boot range which incorporates our own brand of Airseal soles. Airseal Boots are always at the top of the list of our favourite footwear, we have sold loads of these boots over the years, the only trouble with this style is that we make them too well and have to wait a long time for repeat orders! These extra thick, deep tread, translucent soles provide excellent shock absorption, comfort and insulation. They are stitched and heat welded onto a Goodyear welt for strength and durability and take little 'breaking in'. As with all our Airseal footwear they are really hard-wearing. 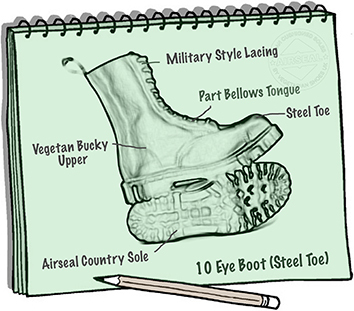 The steel toes make the boots extra tough. (if you need tested safety footwear see style 185 Airseal Safety Boot Mk 2 in the Hiking / Safety Boots section). The High quality Vegetan Bucky uppers (Japanese micro-fibre finished in the UK) wear and age exceptionally well, and they look and feel like supple leather. Breathable and water resistant. These boots are made in one of England's oldest shoe-making factories, established over 135 years ago. Sizing Notes - This style runs large. if you are a regular/large size 8 then you may wish to try the size 8 with insoles. We try to give the best advice about sizing. Please remember sizes vary from style to style and brand to brand. The shape of the shoe can affect the fit as well as the length and width. If replacing a style with a newer version, remember shoes can stretch and mould and become looser over time. A new version of the same shoe can feel tighter and quite different to the old friends you have come to love. Shoes mould to the shape of your feet, more in the width than the length. If they are slightly snug in the width then they may give a little and become more comfortable. If the shoes or boots are tight lengthways then they are likely too small and you need to try the next size up. Lastly, remember that insoles can REALLY make a difference when trying to get the right fit. Ours are quite thick but thinner ones are also available. In addition to making footwear more comfortable insoles can also help shoes and boots last longer.